In this article, we’ll look at how to use Grunt in your project to automate some of your repetitive tasks. We’ll look at what Grunt is, how to setup Grunt and then create a simple project with Grunt doing the heavy lifting of the some of the tasks. While earlier versions came bundled with plugins like JSHint and Uglyify, the most recent release (version 0.4) relies on plugins for everything. One of the best things about Grunt is the consistency it brings to teams. If you work collaboratively, you’ll know how frustrating inconsistency in the code can be. 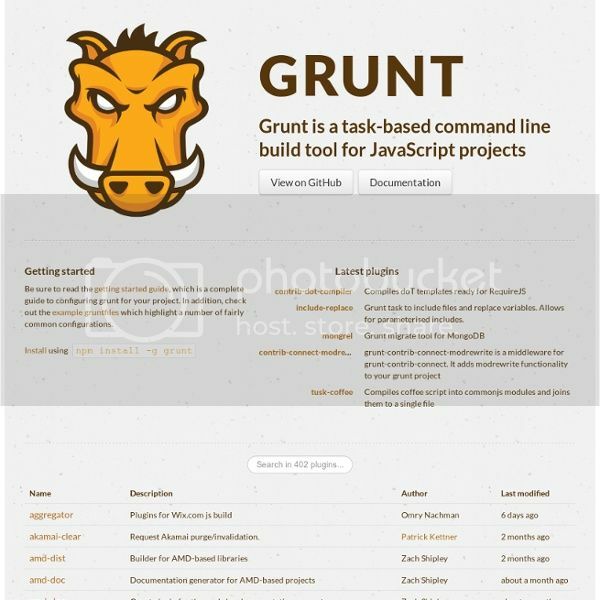 Grunt enables teams to work with a unified set of commands, thus ensuring that everyone on the team is writing code to the same standard. After all, nothing is more frustrating than a build that fails because of little inconsistencies in how a team of developers writes code. Grunt also has an incredibly active community of developers, with new plugins being released regularly. The barrier to entry is relatively low because a vast range of tools and automated tasks are already available to use. The next step is to create a package.json and a gruntfile.js file in the root directory of your project. The JSON file enables us to track and install all of our development dependencies. Then, anyone who works on the project will have the most current dependencies, which ultimately helps to keep the development environments in sync. This tells npm which dependencies to install and places them in anode_modules folder. Gruntfile.js is essentially made up of a wrapper function that takesgrunt as an argument. > Task "default" not found. Use --force to continue. We’d get this because we haven’t specified any tasks or dependencies yet other than Grunt. So, let’s do that. But first, let’s look at how to extend the package.json file. Now that the packages have been installed, they have to be loaded in Grunt before we can do anything with them. We can load all of the tasks automatically with a single line of code, using the matchdepdependency. This is a boon for development because now the dependency list will be included only in the package file. Without matchdep, we would have to writegrunt.loadNpmTasks("grunt-task-name"); for each dependency, which would quickly add up as we find and install other plugins. A plugin is typically configured like this: the plugin’s name (without thegrunt-contrib-/grunt- prefix), then one or more targets of your choosing (which can be used to create custom options for the plugin for different files), an options object, and the files it affects. Now, when we run grunt htmlhint from the terminal, it will check through the source file and make sure that our HTML has no errors! However, manually typing this command several times an hour would get tedious pretty quickly. Then, run grunt watch in the terminal. Now, try adding a comment to index.html. You’ll notice that when the file is saved, validation is automatic! This is a boon for development because it means that watchwill silently validate as you write code, and it will fail if the code hasn’t passed the relevant tests (and it will tell you what the problem is). Note that grunt watch will keep running until the terminal is closed or until it is stopped (Control + C on a Mac).